April 25th marked the anniversary of the Spanish-American War. While barely a notice appeared in the American media, the Spanish-American War of 1898 was instrumental in transforming the United States into an empire. It also established a precedent for the subsequent conflicts of the 20th Century in that the media played a major role in disseminating propaganda intended to rouse public support for war. In early 1898 President McKinley sent the USS Maine to Havana to protect American interests during the long-standing revolt of the Cubans against the Spanish government. 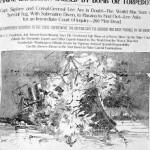 On the evening of 15 February, a mysterious explosion suddenly blew up the Maine. 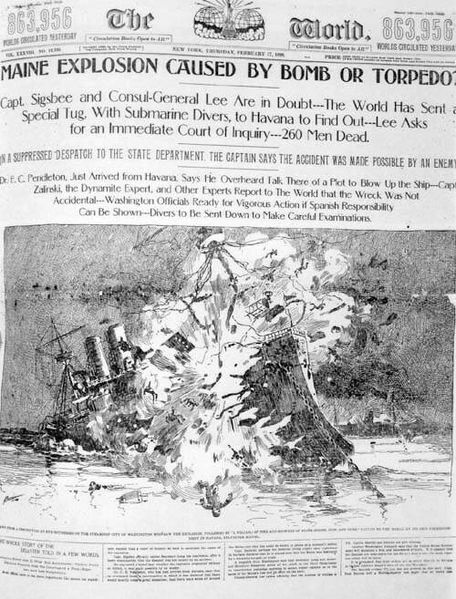 Nearly three-quarters of the battleship’s crew died as a result of the explosion. The immediate assumption was that the sinking of the Maine and the deaths of 260 sailors was the result of Spanish treachery.